SM: When did you start playing golf? Stacy: I learned and practiced on a driving range for two years although occasionally, my husband and I would head over to Saxon Woods or Maple Moor (publinks) and play nine holes of twilight golf, dropping several balls at once for target and sand practice. I thought twilight golf was the perfect way to practice because it didn't take up too much time, it wasn't competitive (learn the basics first) and it was a very romantic way to spend an evening! SM: I wanted to get right into a topic that I find fascinating. Overall the number of rounds played is down, membership to golf courses is down and the participation of women playing golf is down. What could the golf community do to increase the rounds of golf overall and especially with respect to participation by women? Stacy: Reach out to women beyond the scope of the sport and bring them in, making golf less intimidating and more fun. Group events are always fun. Find women in other sports that might not have thought golf was "right" for them and show them the benefits, from fresh air and sunshine to the challenge it offers. Give free beginner lessons, have putting contests...ANYONE can be a good putter! I belong to the Westchester, NY Executive Womens Golf Association which has (more than) a few great ideas to reach out to women including nine and wine, get-togethers and a fun bowling night during the off-season so that women can meet off of the golf course and then, when the time comes, they can feel more comfortable playing with a group that matches their handicap level. The EWGA has mentors and instructors on and off the golf course as well, to bring women into the fold. SM: As a person who lived in the Northeast for four years, my golf game virtually shut down. How do you stay sharp during cold months? Stacy: I regularly swing my (left-handed) Kallassy's Swing Magic, lift weights and walk on my treadmill several times a week. I used to go to my local outdoor heated driving range but, during the cold winter months I usually just putt on my carpet. For more information on the CrossGolfPros visit www.crossgolfpros.com. Will Tiger Woods golf season debut be a hit or a “Miss”? Tiger Woods has been the target of a golf media thashing for two years and frankly I would prefer to concentrate this golf blog on his debut "form" and career objectives rather than on his latest “unprofessional” slamming by Hank Haney. Was Haney justified in releasing a Tiger Woods “tell-all” book, “The Big Miss”, just prior to Woods’ first appearance? Sixty-six percent of fans who were asked said “No”. That being said, the 2012 golf season is taking on momentum and Woods will be making his debut this week in Abu Dhabi at the HSBC Golf Championship. The stage for a Woods return was unofficially set in December when Tiger walked away with his first win in two years at the Chevron World Challenge. Tiger Woods believes, however, that it was in Australia where he gained his greatest confidence, "Australia was big. I hit so many good shots, especially when the wind was howling at thirty mph, with gusts at more than that," and confidence is key to forging ahead. Woods also claims that he is the fittest he has been at the start of a golf season in a "long, long time" and is excited to be competing alongside of up-and-coming players (and first round playing partners) Rory McIlroy and Luke Donald. Does Tiger Woods feels it necessary to test himself against the "new generation" to see if/that he can "rise again, like a phoenix from the ashes of his former self? Ultimately, Woods is focused primarily on winning the majors and using the remainder of the events he will play in as “tune-ups’. Tiger confirmed, “Ultimately, I want to have my game peak four times a year." At least he's dancing... one of his New Year resolutions? Get to know Tiger Woods a little better on Friday; he’ll be answering questions on his Twitter feed @TigerWoods... should cause Twitter to burst at the seams. Abu Dhabi, UAE. Tuesday 24th January, 2012: He’s been in Abu Dhabi for less than 24 hours, but Tiger Woods - one of the headline attractions at this week’s Abu Dhabi HSBC Golf Championship, which starts tomorrow (Thursday 26 January) – wowed onlookers at Abu Dhabi Golf Club today as he shook off the trans-Atlantic cobwebs and ‘moved’ to the UAE capital’s distinctive traditional beat. Abu Dhabi debutant, Woods, an eye-catching contender in what is the strongest field ever assembled at a Middle East tournament, was joined by world numbers two and three, Lee Westwood and Rory McIlroy, for an impromptu celebration of traditional Emirati ayala (celebration) dancing on his first National Course appearance. The ayala dance celebration officially ushered in the seventh annual Abu Dhabi HSBC Golf Championship, which will see triple and defending champion, Martin Kaymer, lock horns with Woods, Westwood and McIlroy, as well as world number one, Luke Donald, in the hunt for the Falcon trophy. Reigning Major champions, Charl Schwartzel (US Masters) and Darren Clarke (The Open), Australian hot-shot, Jason Day, Korea’s top ranked player, KJ Choi, Spain’s Sergio Garcia and Ireland’s Padraig Harrington are also in the star studded line-up. The March of Dimes will be the beneficiary of social media good will. The Farmers Insurance Open golf tournament in association with the PGA Tour will be donating $10 for every like they receive on Facebook. All you have to do is click on the link below, "LIKE" the golf tournament and Farmers Insurance will help give preemies a chance at life. You don't have to reach into your pocket, just reach into your heart. Another great cause helped through social media. As of today, 7,124 people have clicked the "Like" button. Read the note I received below and make sure to donate with a simple click of your mouse!! Be a fan. Support babies! Make your "like" count for something today. Farmers Insurance and the PGA TOUR are kicking off the upcoming Farmers Insurance Open with a generous pledge that will give babies born prematurely a fighting chance at life. For every "like" on Facebook of the Farmers Insurance Open until January 29th Farmers will donate $10 - up to $50,000! - to the March of Dimes. Already hundreds of thousands have been raised. With a simple click of a button, you can help a wonderful cause at www.facebook.com/farmersinsuranceopen. The 2012 Farmers Insurance Open is taking place at Torrey Pines in San Diego from January 23-29. Although he will always be the fan favorite, Mickelson’s season-opener at the Humana is a challenge for Phil and for the event. Both had glory and are now trying to reclaim it. Humana is using charming ex-President Bill Clinton as its new host replacing the incomparable Bob Hope. Once a five-day star-studded event, the Humana has scaled back in size and scope hoping to regain its popularity; the two biggest names in the field this week are Mickelson and Greg Norman, another "sentimental favorite". Mickelson will be attempting to get 2012 off to a strong start in a comfortable setting where he is the leading money winner in order to help reclaim his top-ten spot in the OWGR. Lefty currrently resides in the 14th position in the world rankings. Humana Tournament Chairman Larry Thiel, while welcoming Mickelson to the event, mentioned that Phil chose a comfortable start over a more intense one. The Humana Challenge has a better chance of enjoying a resurgence than Phil. 1. Rory McIlroy joined the PGA Tour this year with the sole purpose of dethroning Luke Donald from the top spot in the rankings. Lee Westwood has also joined the battle. With only ten spots available, Phil is going to have a tough time doing battle with these young guns and will have to revert to using his famous “phony smile”...a lot. 2. Over-forty Phil struggles with a debilitating illness, Psoriatic arthritis, a pain, stiffness and swelling of the joints. At twenty-two, a sore back and a few aches and pains are easily removed with an Advil. 3. The “unspoken law” of the over-forty crowd. When you finally make it to forty, the body doesn’t recuperate as easily or quickly as it once did…ask Phil. 4, When a committee votes you into the World Golf Hall of Fame, you have to be over-forty years old, a PGA Tour player (on the PGA Tour ballot) for ten years and have either ten Tour wins, two majors or two Players Championships to be considered. Ask Ernie Els how well he's fared since his entrance into the HOF. 5. The probability of winning a U.S. Open lessens with age. In the 110-year history of the U.S. Open, only three golfers have won after the age of 40. Mickelson has a 0 for 20 record at the Open. 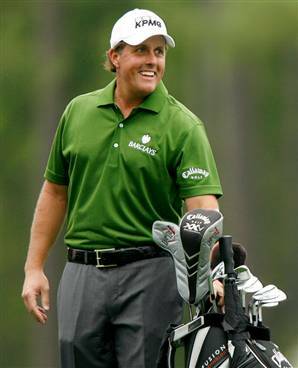 I hope that Phil Mickelson has a great 2012 golf season starting with the Humana Challenge. Although he is my favorite golfer and I will be cheering for him, his time for greatness on the PGA Tour is running out and players who might have once feared his footsteps are now dogging them. If you are a fan of the beauty and majesty of golf courses and how they fit seemlessly into the constructs of nature, then you will love "Golf's Unfolding Drama", a new ebook created by master photographer Evan Schiller. From the cover which displays the 7th hole of Pebble Beach Golf Links (where Tiger Woods will make his 2012 debut) to the 3rd hole at Ballyneal, nature appears to be effortlessly captured and displayed; but it's not without studying the course in advance. The "timing and angle of the sun's rays on each fairway and green" are necessary, states Schiller, in order to determine optimum conditions for each photograph. Capturing drama is a challenge and although Evan has photographed hundreds of golf courses in the past twenty years, Schiller admits, "I’ve also waited hours—even days—to capture many a photograph, anticipating something wonderful to unfold at any moment only to have nothing materialize. At other times, it has just been sheer luck." Take a tour of Evan Schiller's website, Golfshots.com, and view his collection of golf course photography from all over the world (yes, you will ooh and aah as you click through the gallery) and then head over to iTunes.com to learn more about "Golf's Unfolding Drama". This book is "specially designed for the iPad" and available for download on an iPhone, iPad or iPodTouch. I'm sure that one of these extraordinary photos will find their way onto your computer's main screen. My copy of Evan Schiller's 2012 Golf Shots Calendar designs my wall with this month's feature, the extraordinary 15th hole at Ko'olau Golf Club in Kaneohe, Hawaii...simply stunning...and makes me feel as if I'm on vacation even when it's thirty degrees outside! Is the PGA Tour or European Tour now more important to McIlroy, Westwood? One year has passed since Rory McIlroy and Lee Westwood adamantly stated that they would not, under any circumstances, join the PGA Tour, deciding instead to support the growth of the European Tour. This year both golfers have changed their tunes and are accepting membership in the PGA Tour. Why? Can the Euro Tour thrive without them as full-time supporters? McIlroy's reasons to remain only on the Euro Tour in 2011 were selfish to some degree using excuses that he was helping to grow the Tour and that he wanted to stay closer to home. The schedule was longer and tiresome on the PGA Tour, and money could not buy a golfer happiness. Now that Rory's attachments to a former longtime girlfriend has been severed and a new connection has been made with tennis star Caroline Wozniacki, McIlroy has decided it important to match his girlfriend's ranking. It's interesting to see what gets this 22-year-old golfer's juices flowing. Money? Not necessarily. Girlfriend? Top player on Tour? Definitely! McIlroy confirmed earlier this year, "She's number one in the world and I've got a major, and we sort of both want what each other have. It's a big goal of mine. I want to become the best player in the world." Westwood used a blend of sentiments: he was forced to sit on his couch and pine away while the Players Championship took place and also complained that he never took place in FedEx Cup events. McIlroy and Westwood's change of sentiments are a far cry from last year's outbursts but perhaps it's time for both the PGA Tour and Euro Tour to work together in order to make schedules fit for all of the A-level players while improving the visibility of upcoming stars. This way, golf fans will get to see new talent as well as a wide variety of European and PGA Tour standouts. On the "top end" of both Tours, talent is pretty much equal. Looking past the top-100, golfers don't get as much exposure as they should in order to give them opportunities to be seen and get into the mix. Luke Donald has been making waves on the PGA Tour and now McIlroy and Westwood have also decided it important to chase glory. With Tiger Woods back in action for the PGA Tour 2012 season, it looks as if the European Tour once again will fall to the sidelines for golf fans. Great talent like Oosthuizen and the 2012 Race to Dubai will certainly pale in comparison to a possible Tiger Woods, McIlroy duel on Sunday during a major tournament.